I have been making more than my fair share of exceedingly sweet things this month, as I have completed my first Daring Baker's challenge. I usually actively try to avoid baking really sugary treats, as I find sugar so addictive that I have to exercise extreme will-power not to eat everything at once. However the rest of the family are rather partial to sugary snacks, so I have made the odd recipe to keep them all happy! We are having a big, big clear out of our small, small kitchen at present in preparation for a bit of a re-jig to make the workspace a bit more practical. So every evening has seen me with my head stuck right to the back of the cupboards, packing boxes and investigating sell-by dates. And oh, the shame! One unidentifiable tin was dated 1-10-2003 which means that it has moved house with us at least once and possibly up to 3 occasions. The label was gone and whilst I was quite happy to open and investigate, I was out-voted and the tin was binned. We had the weirdest selection of wafer biscuits and digestifs from central European countries, pasta from East Germany (thank you to the many language student visitors) as well as a random selection of cup-a-soups (some of which are now out of production, does this make them collectors items?) which pre-dated my going gluten free. It is going to take a while for us to get the kitchen re-organised, so I can only apologise for the fact that I will continue to be a bit light on new recipes for the next couple of weeks. Once we are there though, we will christen the space with a roast Rib of Beef from Paganum which is taunting me with it's deep red and creamy white beauty whilst patiently waiting for us to demolish it. In the depths of one cupboard languished a huge tub of wholesome peanut butter, dark brown and chunky, with neither salt nor sugar added. It was well within date but the tail end has been neglected in favour of a jar of glowing yellow American Skippy peanut butter recently acquired from Costco. Whilst the flavour of this wholesome version was still great, the contents were drying and lumpy yet too good to chuck, so I looked for a way of using this up. Another find was a box of homemade biscuits - the last of the shortbread that we made at Christmas as gifts but ungiven due to the snowy weather. And when a tin of condensed milk rolled out of the cupboard onto my toe (ouch! ), a plan was formed. There are two ways of making this, both are quick and easy but they depend on the ingredients that you have to hand. If you don't have a bunch of biscuits to hand - and to be honest, if you have to buy gluten-free biscuits you probably don't then want to crush them up and use them for something other than dunking in a good cup of tea - you can bake the base fresh, which is quick and easy too. Of course, and as usual, you can substitute the gluten free flour ingredients for wheat flour if you want. You can omit the peanut butter filling and replace it with a jar or tin of ready made dulce de leche for an even quicker recipe. Both the biscuit base and the baked shortbread base can be used for a myriad of other toppings and bar-style cookies so they are both really handy recipes to have in your repertoire. I made this last night with the crushed biscuit base, the 3 stages took no more than 20 minutes in total with chilling time on top. If you freeze your biscuits before you use them, the chilling time will be reduced. line an 8"x8" square tin with non-stick baking paper. crush the biscuits. I chucked the biscuits in to a pyrex mixing bowl, grabbed a flat-ended rolling pin and pounded them with the blunt end as if I were using a big pestle & mortar. press the mixture into the tin firmly and then chill in the fridge until cold and set. Melt the chocolate ingredients together, keeping the mixture as cool as possible. Chill again and allow around an hour before serving. Yum, this look delicious! Do you think you could substitute other nut butters for peanut? 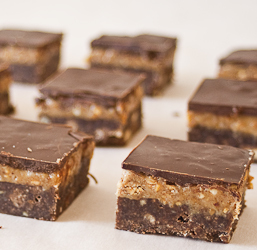 That looks delicious, remarkable what you can make from the back of the cupboard! 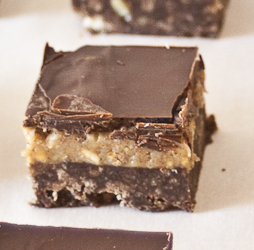 Those shortbread bars look GORGEOUS! I just completed my first Daring Bakers challenge today - can't wait for the 27th! I like your pictures - clear and well composed.